The Council on Foreign Relations (CFR) – The twenty-first century shift in geoeconomic power toward Asia has also spurred a rebalancing in global pharmaceutical research and development (R&D) investment toward emerging economies. China is currently the world’s second-highest investor in R&D and is poised to overtake the United States in R&D spending by 2023. Determined to become a world leader in the pharmaceutical sector, China spent $1.17 billion on promoting life and medical sciences in 2012—nearly ten times its 2004 level of investment. With U.S. funding for medical research on the decline, the surge in Chinese funding has prompted many policymakers to ask if the country’s pharmaceutical industry could be the next game changer for global public health and access to medicine (ATM). During the Mao era (1949–76), China’s weak R&D capacity and decades of autarky thwarted its pharmaceutical sector from making any direct and substantial contribution to global health. For example, even though Chinese scientists discovered artemisinin-based therapies (the most effective antimalarial drug) in the 1970s, it wasn’t until the 1990s that the drugs were marketed in other parts of the world through multinational pharmaceuticals such as Novartis and Sanofi. Economic reforms, starting in the late 1970s, presented new opportunities for the pharmaceutical sector. With its tremendous revenue-generating potential, the government actively fostered the industry in pursuit of economic growth. Between 1980 and 1999, the number of pharmaceutical firms increased almost tenfold, from 680 to 6,357. By the 1990s, China had built a relatively robust pharmaceutical sector. As pharmaceutical firms began to proliferate, the state made serious attempts to regulate and weed out unqualified manufacturers. By May 2005, nearly four thousand pharmaceutical makers, or 78 percent of firms, had been certified as implementing good manufacturing practice (GMP). 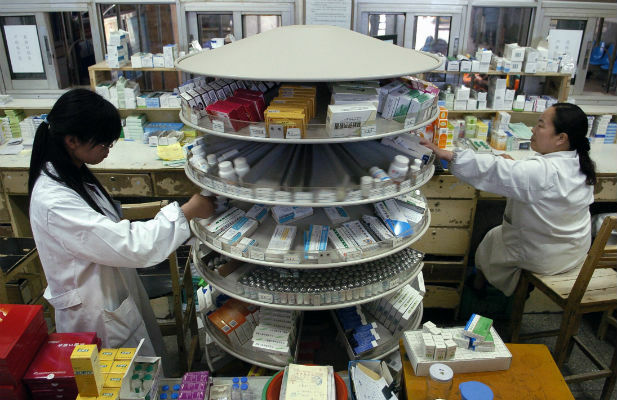 Meanwhile, at the urging of the state, major Chinese pharmaceutical firms began setting up subsidiaries and local distribution channels overseas, while playing an active role in China’s health-related development assistance to other countries. In 2011, China started to pursue an explicit policy mandate to develop its domestic life sciences and pharmaceutical industries. Between 2011 and 2015, the state invested a total of $1.1 billion in new drug development. China’s ambition to become a global player in the pharmaceutical industry was buttressed by a growing number of overseas returnees who had received training in health and life sciences outside of China. Of the overseas returnees that the Beijing municipality attracted between 2009 and 2012, for example, 40 percent had expertise in biomedical science. China’s advancement in the pharmaceutical sector has profound implications for global health, especially in its potential to open up access to affordable life-saving drugs. With an annual output of 800,000 tons of pharmaceutical ingredients, China became the world’s leader in global active pharmaceutical ingredient (API) manufacturing and exports in 2012. Its ability to produce and supply APIs is of critical importance to the global generic drug market, as well as to formulators in emerging economies (e.g., India) and the developed world. APIs from China have also been essential in the fight against major infectious diseases such as malaria and avian flu. Until recently, China had been the primary supplier of shikimic acid, the base ingredient in the antiviral drug Tamiflu (a flu medication recommended by public health organizations to combat a possible flu pandemic). Chinese pharmaceutical leaders, however, are not just content to be API suppliers. Tapping into China’s low-cost, skilled labor, contract research organizations (CROs) providing research support to the pharmaceutical, biotech, and medical device industries have also proliferated. Currently, there are about three hundred CROs in China providing preclinical and clinical research services to multinational pharmaceuticals. These CROs signal China’s innovation potential in pharmaceutical research and development. Among the most well-known is WuXi PharmaTech, which has more chemists than any other CRO in the world. China has also made some progress in developing innovative pharmaceutical products. Since 1986, China has independently developed about forty chemical drugs, including Bicyclol (for treating chronic viral hepatitis B and C), dl-3-butylphthalide (for treating ischemic stroke), and sodium glycididazole (for treating Nasopharynx cancer). In 2003, China’s Food and Drug Administration (CFDA) approved the anti-cancer drug Gendicine, the first gene therapy product approved for clinical use in humans. Participation in international cooperation over health-related science and technology further increased China’s ability to contribute to global health. In October 2013, the Japan encephalitis (JE) vaccine developed by China’s Chengdu Institute of Biological Products achieved WHO prequalification. The JE vaccine, whose development received technological support from PATH, is the first single-dose JE vaccine that the WHO has approved for use in children. Most recently, China surprised the world by announcing that it had successfully developed its first drug for treating Ebola during the 2014 outbreak. Despite its impressive growth, China’s role in API production and supply, as well as its accommodation of CROs that serve primarily multinational pharmaceuticals, remind us that the country’s pharmaceutical industry remains positioned at the lower-end of the global value chain. Moreover, China has few domestically developed new drugs or vaccines that are internationally known and/or marketable. According to the CFDA, more than 95 percent of chemicals produced in the country are generic. Many of the so-called “independent innovation” drugs are actually copycat drugs from a clinical point of view. The much-vaunted anti-cancer drug Conmana, for example, has the same mechanism of action and no real difference in efficacy and safety from the other two agents in the class that are already on the market. And even with a large generic drug industry, China still trails other emerging powers like India in providing medicine to the developing world. Thus far, only a small number of Chinese pharmaceutical companies have been GMP-approved by the WHO; even fewer Chinese pharmaceuticals have received WHO prequalification to supply to international organizations and donor funds. That explains why China has only had eighteen drugs included on the WHO’s list of prequalified medicinal products for procurement, compared to 355 from India. Several institutional, policy, and capacity-related challenges will need to be confronted if China’s pharmaceutical sector is to fulfill its potential. Product safety remains an issue. In an attempt to show that it was serious about cracking down on corruption in its pharmaceutical sector, the Chinese state executed the former head of its FDA in 2007 for accepting bribes of nearly $850,000 to approve faulty drugs. Five years later, another top CFDA official was jailed for soliciting bribes from drug companies. Innovative firms also continue to struggle with a socio-political system that supports censorship, disregards intellectual property rights, and suppresses curiosity and creativity in its education system. This might explain why, despite the size of Chinese pharmaceutical exports ($67 billion annually), virtually none of this revenue is derived from truly innovative products. Second, an industrial policy that supports the pharmaceutical sector is currently out of sync with other public policy objectives. In order to incentivize original drug development, the market and the state should reward firms that create genuinely innovative products with profit margins significantly higher than their generic counterparts. But this conflicts with the government’s objective of ensuring affordable access to health care. Since 1998, the National Development and Research Commission has actually lowered drug prices more than thirty times. The state has become an unwitting sponsor of a pharmaceutical industry that produces cheaper, generic, essential drugs for domestic use, which, in turn, directly hurts the local patented drug market. Third, current industrial policies have hamstrung China’s ability to effectively contribute to new drug discovery and innovation. Among the newly added projects in the 2015 “Major Drug Discovery” initiative, most of the listed drugs and biologics are those that are also being developed by multinational pharmaceuticals. The review time for new drugs is about eighteen months in China, and it may take eleven months for a drug selected for priority review to complete the process. Comparatively, the U.S. FDA is normally given ten months to review new drugs, and is allotted six months to review a priority drug. In other words, a “new” drug in China will likely be developed after similar products from multinational pharmaceuticals have already been patented and marketed in the country. Finally, China’s R&D capacity in the pharmaceutical sector, though growing, continues to lag behind those of foreign firms and their subsidiaries in China. In 2013, multinational pharmaceuticals (Roche, Novartis, Johnson & Johnson, and Merck) each spent more than 10 percent of their revenue on R&D, compared to less than 2 percent on average invested by major Chinese pharmaceutical firms. The total R&D expenditure of the combined thirty-six vaccine manufacturers in China cannot match any single one of the so-called Big Five pharmaceutical companies (Sanofi, GSK, Merck, Novartis, and Pfizer). Over the past decade, there has been growing international pressure for China to assume a leadership role in global health. The country’s growing investment in life science-related R&D, in conjunction with its entry to global pharmaceutical market, has only ratcheted up such expectations. While China has made great strides in contributing to the global supply chain and ATM-enhancement, several institutional, policy, and capacity factors have severely constrained the country’s ability to build upon existing success to become a true innovator in the pharmaceutical industry. In the absence of fundamental changes in governance, industrial policy, and R&D capacities, it would be premature to call China’s pharmaceutical sector a game changer in global health.